Will Drum For Food T-Shirt – Let everyone know just how committed to drumming you are! This clever take on a popular saying is sure to be enjoyed drummers everywhere. 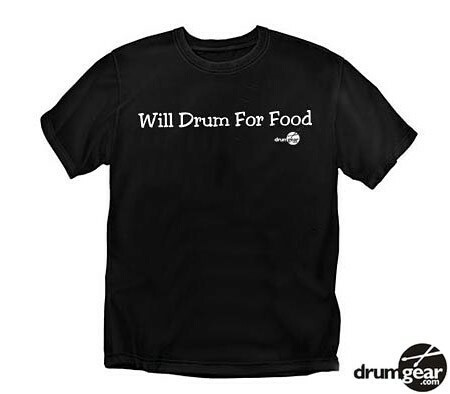 The “Will Drum For Food” T-shirt is sure to be a hit with your favorite drummer! Design is on front of the t-shirt. Professionally screen-printed 100% cotton, pre-shrunk tshirt featuring the attractive “Drum Gear” apparel logo. Available in SM, MD, LG, XL and XXL.